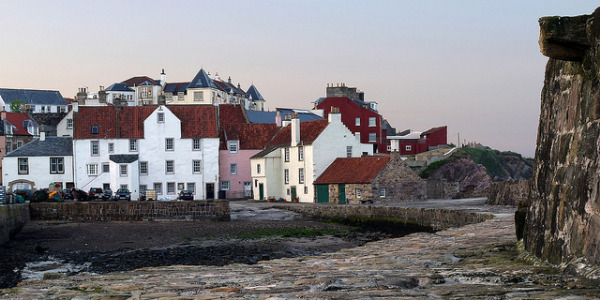 Pittenweem Rowing Club was founded in 2010 as part of the Scottish Coastal Rowing project. The project aims to bring back the tradition of boat building and encourage Coastal Rowing and Racing around the Scottish Coastline. Our first task was to raise funds to allow us to build our boat , it took about 18 months to complete the build and finally launch our boat " Fisher Lass". The skiff was launched on the 19th of May 2012 with its distinctive colours of the Royal Burgh of Pittenweem Crest and the Club’s very own logo designed by local artist Isobel McAslan. The name “Fisher Lass” as well as the village name appears prominently on either side, making sure that everyone who sees her knows where she is from and that her home is Pittenweem. We are a small friendly club with a passion for just getting out on the water and enjoying ourselves. The boat is usually launched from the Gyles in Pittenweem when the tides are right or alternatively from Elie Bay. The club holds regular training and coaching sessions in the evenings during the rowing season , usually on a Monday and Thursday and social rowing on a Friday. If you are interested in joining our club , come down for a chat and try rowing. Once you have been out on our boat you'll be hooked just like we are. Alternatively you can use the contact form and our secretary will reply and answer any question you may have. Why not contact us and come along for a row.